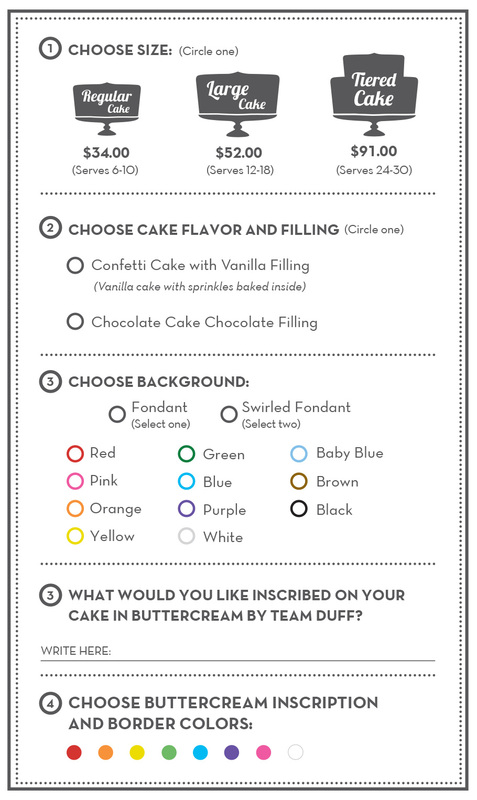 Duff’s Cakemix is a do-it-yourself cake decorating studio founded by Food Network star, Duff Goldman. We provide everything you need to create the cake or cupcakes of your dreams, including the canvas (cake or cupcakes), fondant, colorful frosting, decorations, candies, decorating tools, and help from Team Duff. We accept walk-ins, and offer reservations, party packages, private events, and off-site events. Come up with an idea for your design. Check out our Instagram account or peruse our examples and step-by-step guides in-store. + $12 studio fee per person which includes access to tools, stencils, molds, cutters and Team Duff, plus we clean up the mess! Click below for party packages, private event pricing or off-site events. Build your kit with fondant, colorful frosting, decorations and candies. Cake decorating is the perfect activity for family outings, birthday parties and team building events. We can even bring the party off-site to your home, office or a public space. Sign up to receive invitations to special events, new store opening announcements, exclusive content and insider tips!